Discount applied immediately at time of purchase . Also become a Piping Rock rewards member and receive discounts when you refer others. We proudly offer you our ever-growing selection of products designed to help you achieve your healthy lifestyle goals at the lowest cost to you. We strive to make sure everything you need to reach the bliss of health and happiness is right at your fingertips… and we mean everything! From traditional supplements to exotic herbs, holistic oils and more, we feature the products you’re looking for and ones you simply won’t find anywhere else. To put it simply, Piping Rock is the one-stop-shop for health-conscious consumers… but how did we get here? It all started in 1971 when my father, Arthur Rudolph, began manufacturing vitamins. I was 14-years-old at the time, but found myself inspired. I followed my father’s work, carefully watching his process and learning the ins and outs of the industry. It wasn’t long before I discovered that, like my father, I shared a passion for people’s health! As a 19-year-old college student, I started my own vitamin company. On nights and weekends, I packaged products by hand–one customer at a time–until my business thrived. In 1986, my father and I teamed up to form Nature's Bounty (NBTY), making it the world’s biggest vitamin manufacturer over the next 24 years. 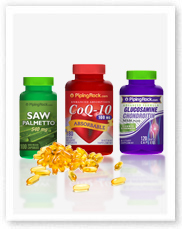 ​In 2011, we took our achievement to the next level by forming Piping Rock Health Products. Proudly joined by my son Michael, Piping Rock is truly unlike any other natural products company! With Piping Rock, our dream spanning three generations is realized: to make superior quality vitamins, supplements and natural products affordable and easy to access for everyone… because we truly believe that everyone deserves great health. To this day, my greatest wish is for you to be happy and healthy. I want you to return to us because you feel that our products have helped you in your health goals, and I want you to share your products with those you love, passing on great health and even greater savings. So please enjoy the savings we offer, the quality we stand by, and our growing collection of health-supportive products! Share the products you love with your friends and family, They receive a discount and you earn Rewards Money to use on future purchases or get cash. How do I get my Rewards code? You can see your rewards code by Signing In. Your rewards code is displayed at the top of the page. Please note that you must first have placed an order on PipingRock.com in order to sign in and access the Piping Rock Rewards program. How do I share my Rewards code? 1) Send others a link with your rewards code. This is the best way to share as your rewards code will be applied automatically during checkout when they click your link! You can create custom links using our Make Your Own Link Tool. 2) Share a custom shopping cart. Create your own shopping cart on PipingRock.com and share it through a link. When referrals click the link, your cart products and code will be applied automatically. Please note you must be signed in when creating the cart to earn Reward Money. Learn more about how to make a Share A Cart link. 3) Send others your 6 digit rewards code. You can also send others your 6 digit rewards code. Referrals must enter the code during checkout. Where can I share my Rewards code? There are many places to share your rewards code with friends, family and followers. We recommend sharing over email, Facebook, Twitter, Youtube, blogs, forums, and other social media and video sites.